It’s never fun when a dead battery leaves you stranded, but in cold winter weather it can be dangerous. 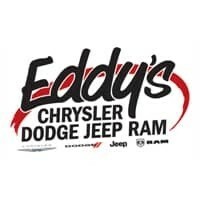 Bring your vehicle to Eddy’s Chrysler Dodge Jeep Ram, and we’ll perform a battery test absolutely free of charge! Sometimes batteries will give you an indication when they’re dying; it may take several tries to start your vehicle, for example. However, this isn’t always the case–and when you’re stranded in the cold, things can get unpleasant. Our technicians will hook your battery up to a testing machine, which will let you know how much life your battery has left. If you need a new battery, we have a number of genuine OEM replacement batteries; and if you don’t, you can be on your way. Either way, it’s hard to beat something free, so come by Eddy’s Chrysler Dodge Jeep Ram today! Must present coupon when order is written. Cannot be combined with any other offers or previous purchases. Some restrictions apply. See dealer for full details. Get a lube, oil and filter change today for only $28.95! Conventional oil only. Plus tax. Not valid with any other offers. Some Restrictions may apply. Must present coupon at the time of service write-up. Contact dealer for complete details. Conventional oil only. Plus tax. Not valid with any other offers. Some Restrictions may apply. Must present coupon at the time of service write-up. Contact dealer for complete details. For a limited time, have your alignment checked for only $9.95! Plus tax. Some restrictions may apply. Must present coupon at time of purchase. Doesn’t apply to prior purchases. See dealer for full details. Have peace of mind while driving and have your brakes inspected today! Buy 4 new tires at regular price, and get your next tire rotation for free! For a limited time, coolant drain and fill for only 129.95!